Wastewater treatment requires an aggressive usage of hazardous chemicals. As a result, it is necessary to properly store chemicals to maintain their effectiveness prior to being used. 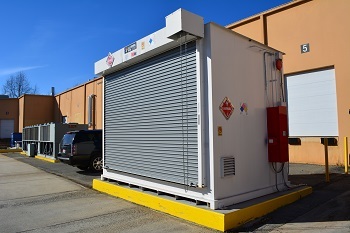 Treatment processes may also require 90 day storage after hazardous materials have been used. Learn more about the type of chemicals used in wastewater treatment facilities and how to manage them during storage below. To remove solid particles within the wasterwater, chemicals including aluminum, ferric chloride, polymers are used to neutralize negative charged solid particles. Some of these acids are highly corrosive and require heavy-duty polyethylene containment sumps, while being stored inside hazardous material buildings. When wastewater is collected, the odor comes with it. Chemical treatment is used to control the odors present at facilities. Type of chemicals used include calcium nitrate, sodium hydroxide and hydrochloric acid. Hydrochloric acid is highly corrosive and requires safe storage processes. Safely store hydrochloric acid totes with tote storage buildings that offer roll up doors for easy forklift loading/unloading. It is mandatory to prevent the spread of disease and special chemicals in controlled facilities. One of the most commonly used disinfecting chemical is chlorine. Chlorine should be protected from sunlight when stored. Due to its nature, UV radiation can deteriorate and breakdown underchloric acid molecules, hindering chlorine’s effectiveness. Chlorine chemicals should be stored away from direct sunlight. Chemical storage lockers with natural ventilation or mechanical ventilation offer a safe storage atmosphere for chlorine chemicals. To reduce volume, water must be removed from big pools when transporting sludge to landfills. This process offers institutions with a less expensive transportation system. A polymer chemical is used to remove water from the sludge, when storing wastewater in pools. This provides a separation that provides efficient pumping processes. Safely stored polymers in chemical storage lockers that include mechanical ventilation or natural ventilation to rid fumes from entryways. Poly Processing. Ferrics, Alums and Polymers. EPA Waste Water. AP, 42 Vol. 1, CH 4.3: Wastewater Collection, Treatment and Storage.